Often, when you want to share a contact with someone, you don't want to give them all the information. Perhaps you want to share the work address and phone, but not the home address and phone. Or you'd like to share the office phone but not the mobile phone number. The EmailContact settings gives you great flexibility in what you want to share. EmailContact shares contact information via a simple Email plain text message anyone with a mail client can read anywhere. 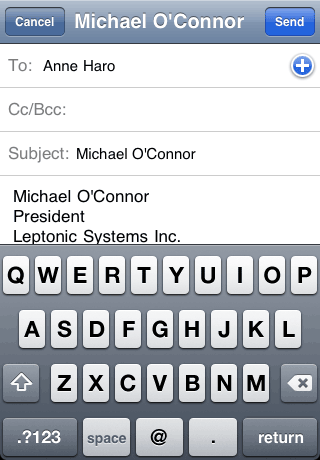 Most mail apps can copy the info into their own contacts or address book from there. It only takes a few seconds to send your chosen contact information. Launch EmailContact and a list of contacts appears. Tap one and a mail message with just the info you ant is set up. Enter the recipient name and go!